Great food and nice place casual. We really like this place, great food cool atmosphere. I love the prime rib french dip. Decent food seems to be popular with the locals had a bbq tri tip sandwich on grilled sourdough with cheddar and carmalized onions. Neat little pub atmosphere. Some of the best food in Tuolumne County. Very decent beer selection and they let you have dogs out on the front deck with beer and all. I went when they had a special going for Guinness beef stew with mashed potatoes and it was absolutely fantastic. Highly recommended. Feels like a very nice English pub with delicious burgers! The service was excellent. We thoroughly enjoyed our dinner at The Rock. Omg the food was so bomb!! The Rock is a Twain Harte institution. I love the old lodge vibe. Food was very good and staff incredibly friendly. I deducted 1 star as service was a bit slow due to under-staffing. We eat here all the time! They have great burgers, and I have gotten in the habit of taking dessert to go. Good place for some local craft beer too. Amazing service and food. Our waitress was excellent and friendly. We had a variety of food from burgers to fish tacos and everyone in a party of 10 was happy with their food. Great job we can not wait to visit again. Food is excellent staff is awesome. Definitely go there and eat up. Also they have good beer and wine choices!! Great choices for your kids! I been going to the Rock every since we moved to Sonora in 2000. Although my husband passed, when my family come’s up to see me, we go to the Rock for lunch or dinner. Love the food and the service we receive. Some of the nicest staff you'll ever come across. Great food. Great service!! Definitely bring your family!! Plan on staying for the evening for the beer and wine. This is the best place to eat they have it all. I got a salad husban got chicken strips fries an coslaw. OMG best ever if recommend it to anyone. We stopped going here after the prices went up. The food is fine, but never blew me away, the servers are generally nice and the room is clean and has a good atmosphere. We just don't feel its worth the money. Food is good. Ambiance, friendly, parking, tv get there early. Popular for dinner. Had the fish and chips and it was the best. My hubby had the fish tacos and really enjoyed his meal. Always good food. Service was very good, too. The chicken wings are the best ever, brine overnight and then smoked for like 3 hours! Thanks loved them! The food was very good. We had the prime rib sandwich and it was very good and very filling. The sweet potato fries were cooked perfectly. The service was excellent and friendly. The atmosphere was comfortable and cozy. We will definately go there again next time we stay in Twain Heart. This place is always packed! Food is decent, but can be hit and miss. It's always loud because it's a local favorite. The Irish burger is the best thing on the menu in my opinion. Beers are always delicious and cold and can be a nice way to pass the time as the service can be slow- but again that's because it's packed. Awesome. But then it always is. Their cook, Rylan, is amazing and has never served us anything but 5 Star meals. The service is just as great with an atmosphere to match. Thanks for playing attention to what makes great restaurant for people to enjoy. 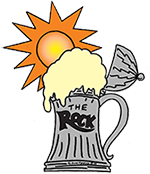 The Rock is a Rocking place to grab a killer burger and a local beer! Great small town setting with great food! Good food and not too expensive. If you go on Wednesday or whatever day they make their stew, it is the bomb. Along with the beer bread. This is the spot in Twain Harte. They are doing food and service right up the hill.Bravo! Some of the vest food anywhere! I had the fish and chips and it is the best I have had. I tried the patty melt, which was excellent. If you do have a meal here, save room for desert. The carrot cake is the best I have ever had and it's not even my favorite kind of cake. I highly recommend coming here. Best French Dip I’ve ever tasted. Love love love everything about this place,the people, food, atmosphere, prices I believe to be averags. The dessert is amazing. Must go. Best garlic fries you'll ever have!! Great food and service! Everything was fresh and delicious. Highly recommend the sweet potato fries! The French Dip was delish, and the fries were cooked perfectly. Good beer choices. Good, tasty burgers. Sriracha burger one of the best. The food quality is great. Decent staff. When you make plans to eat here, do so on a slower night or get something to go. We waited an hour and a half for our food after the waiter took our order once, but over all, we generally have a good experience. Thanks for this dinner. The food was just amazing ( french people is talking) and beers excellent. The waitress was smiling and really kind. Thanks Thalis we will come back for sure on Tuesday!!! Trash can nachos were awesome! Great service, even better food. The best food and service Ever!!! !